Seduce the eye and romance the palate with this free walking tour of Roma! Follow this guide for a delicious walk through Rome’s historic center where you’ll enjoy some of the city’s most atmospheric sites, stopping along the way to sample fine Italian prosciutto, espresso, gelato, and more! Rome is an easy city to get lost in. Street names aren’t always marked, especially at intersections where you might expect them to be. To help you navigate, I’ve created a custom Google Map with all of the stops clearly marked. You can access the custom map HERE. To access via mobile, click on the link while using your mobile device. Note: You’ll need an internet connection if you choose to navigate using the custom Google Map. It’s up to you. The tour works well for one, two, or more. Almost all of the tastings can be enjoyed standing so you won’t need to worry about finding a table. Most of the places you’ll be stopping at are quite small and, depending on the time of year, may be crowded. Expect to queue during busy times, and if you’re doing the tour as a family or group, it’s possible you may have to take turns going inside to order. For most food stops, I’ve included suggestions of what to eat or drink, along with a price estimate. The majority are small bites that, together, add up to a very filling meal, but depending on your appetite, dietary preferences, and the size of your group, you may want to taste something different. Most stops have something suitable for vegetarians, as well as a gluten-free choice. Be sure to bring along some cash since not all of the businesses accept cards. If you follow the suggesting tastings, you can expect to spend about 14 € on food and drink. If you still feel compelled to tip, I get it. Old habits die hard. I just round up to the nearest euro. Feel free to fill your water bottle at any of the 2,500 drinking fountains scattered around the city. The water is cool, clean, refreshing, and perfectly safe to drink. Be aware that eating and drinking are not allowed within 10 ft of any monument in the old center. (That includes the Pantheon and Trevi Fountain) Violators can be fined up to 500€. The tour begins at Piazza della Rotonda where you’ll find one of Rome’s best-preserved buildings – the Pantheon. Try and picture the piazza as it looked a few hundred years ago when a busy fish market was held around the fountain. Head over to the entrance to the Pantheon and look for the holes in the portico columns. They once held poles that supported the awnings for the fish market stands. If you haven’t already, pop inside the Pantheon and have a look around (2€ entry fee). The interior, with its magnificent dome, is Rome’s greatest architectural wonder. Walk to the center of the room, stand under the oculus, and gaze up at the sky. Click on ‘More Options’ at the top of any of the maps for turn by turn directions. 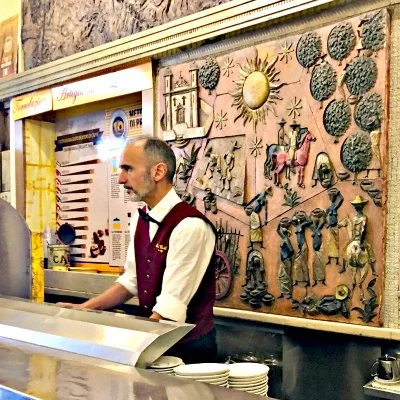 For a genuine Roman coffee in a historic setting, Sant’Eustachio is hard to beat. They’ve been producing great coffee here since the 1930s and have developed something of a cult following. The reason is that they roast the beans over wood in the back of the shop, then blend them with water from an ancient Roman aqueduct. Each shot of espresso is pulled behind a metal partition so the secret to their extra-thick, luscious crema remains a mystery. When you enter the shop, the pastry counter and register are on your right. Pay at the register, then take your pastry and your receipt over to the bar. (If it’s busy, try placing your receipt on the counter with a 50 cent tip on top. When the barista looks over and sees 2 or 3 receipts on the counter, and only one has a tip, chances are you’ll get served first.) Sugar is added to the coffee beforehand so make sure that you ask for senza zucchero (no sugar) BEFORE ordering if you don’t want any. A caffè is a single shot of espresso, a cappuccino is a shot of espresso topped with half steamed milk and half foam, and a latte is a glass full of milk. Their signature coffee, il gran caffe, is a larger espresso that is extra rich and creamy, even though it has no milk in it. If you sit down to eat, the price increases by 2.50€ per person, so enjoy your caffè and pastry standing up, like a local. You won’t be tasting anything here. Instead, this stop is a visual feast that will whet your appetite for the delicious bites waiting for you up ahead. Dating back to the 1890’s, Angelo Feroci is the most beautiful, and the most expensive, butcher shop in all of Rome. The founder, Angelo, was recognized for his butchering skills back in the day when he received a gold medal at the international exhibition in London in 1924, as well as at the international fair of Rome. Take a minute or two before you enter this historic temple of fine food to check out the tantalizing display of lamb chops, steaks, and meatballs in the shop window. The inside of the store is ultra-luxe with marble-on-marble countertops and benches, a mosaic floor in black and white Carrera marble, a huge black bull mounted high on the wall, and a clientele that looks like they just stepped out of an Italian fashion magazine. A gruesome-looking pig’s head sits atop the main display counter. Don’t be afraid to get closer so you can admire the exceptional meat products below, including house specialties like plump stuffed chicken legs and strips of veal dressed with pine nuts and deep purple radicchio. A second display counter on your left houses platters of prepared dishes and vegetables like Carciofi alla Giudia – whole artichokes with just the outer leaves and the inner hairy choke removed, then deep-fried in olive oil until crisp and golden. Deliziosissimo! If you’re staying in an Airbnb, circle back here after the tour and pick up something amazing for dinner. While the food is definitely on the expensive side, the quality is second to none. Lindt is right next door to Angelo Feroci. Late Fri and Sat until midnight. Lindt opened their flagship store in Rome in 2013, and ever since, tourists and locals alike have been coming here to indulge in this Swiss chocolatier’s fine quality chocolate. Enter the store and breathe in the intoxicating aroma. Mmmmmmmmm. Chocolate heaven. Now, look around. In the front section, you’ll see a coffee bar offering a variety of chocolate-based coffee drinks, decadent opera cakes, crepes filled with chocolate, delicious gelato, and the most amazing affogato (vanilla gelato with a shot of espresso) you’ll ever taste. Even the spoons here are dipped in chocolate. At the back of the store, there are huge displays of chocolate bars and bins overflowing with irresistibly smooth Lindor truffles that you can mix and match. The selection is incredible and includes many flavors not available in North America. There is usually a friendly employee offering free samples, but if not, buy one or two flavors you’ve never tried before. You deserve it. Tasting chocolate is a bit like tasting wine, with a recommended order of progression. If you’re tasting more than one kind, begin with the chocolate with the least percentage of cocoa. Start with white chocolate, then milk chocolate, and finally, dark chocolate. And be sure to let it melt slowly in your mouth. 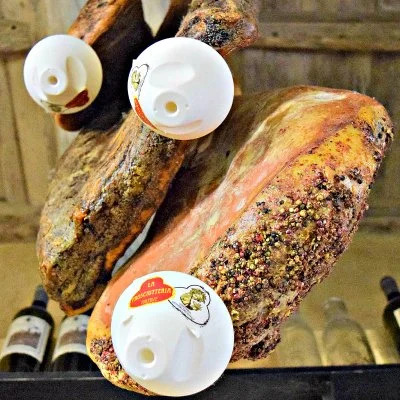 La Prosciutteria sells high-quality, house-made wine and salumi, served on olive-wood boards or between two slices of bread. Their philosophy is simple. Eat incredibly well while spending as little as possible. The teeny-tiny space is dominated by a meat and cheese counter. Salumi and hind legs of prosciutto hang from the ceiling with small bowls attached underneath to catch any drips. Everything here is sliced to order. Since La Prosciutteria is not legally a restaurant, there is no table service. Menus can be found on the walls. A self-serve cutlery and water station is located near the back of the room. There is no cover charge and no table charge, and in a city where it costs two or three euros to sit down and eat, that’s a pleasure to find. Salumi (salted meats) are an Italian staple. While most American cold cuts are cooked, in Italy they are far more commonly cured by air-drying, salting, and smoking. The two most familiar types of salumi are salame and prosciutto. Salame is an air-dried, sometimes spicy sausage that comes in many varieties. Prosciutto is a dry-cured ham made from raw legs of pig (preferably female) that can be either dolce (sweet) or salato (salty). Purists say the best is prosciutto Di Parma. Ask the friendly staff to include a few different varieties when they put together your tasting plate. You’ll be amazed at how different each type of prosciutto tastes. There are only a handful of tables inside so try to avoid arriving during peak hours (between noon and 1:00 pm, or 6:00 pm – 9:00 pm). If the line is long, grab a delicious porchetta panini to go instead. Eat it standing, just outside the shop. In Rome, only tourists walk around eating their food. Try the signature San Crispino flavor (with bitter honey from Sardinia). 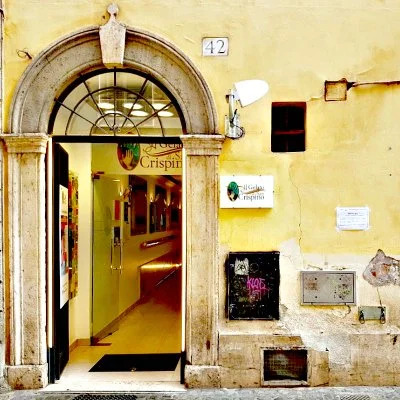 ll Gelato di San Crispino serves what many consider to be the best gelato in Rome – some say in the world. At San Crispino, they use only top-notch, all-natural ingredients from Italy. Their zabaione gelato, for example, is made with De Bartoli Marsala that’s been aged for 20 years. Likewise, their licorice flavor is made with licorice root from Calabria, lemon with IGP lemons from the Amalfi Coast, and pistachio with pistachio nuts that come from the town of Bronte in Sicily. In a city chockablock with gelaterias, it’s high-quality regional ingredients like these, along with the absence of artificial colorings, preservatives, and chemical emulsifiers, that really set them apart. San Crispino keeps the flavors of the day in metal tubs covered with shiny lids. Gourmet flavors like ginger-cinnamon, chocolate rum, armagnac, and fresh walnut with dried figs make it hard to pick just one. By the way, there are no cones at San Crispino. You also won’t find any sauces, toppings, or sprinkles. The emphasis here is on serving gelato in its purest form, in a paper coppetta (cup). 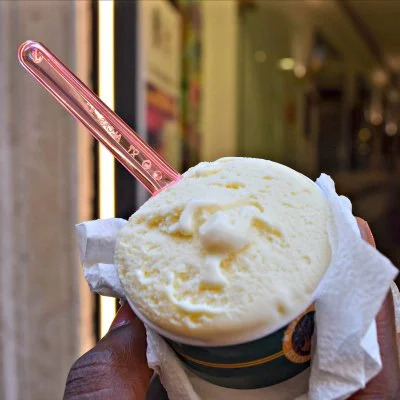 For Italians, gelato is much more than a sweet treat. It’s an essential part of daily life, and they are as loyal to their gelato shops as they are to their soccer teams. When it comes to choosing a flavor, locals don’t ask for samples. They pick one and commit. And if the person behind the counter asks con panna (with cream), their answer is always yes. There’s also a branch at the Fiumicino Airport (Terminal 1) so you can get one last gelato fix before you go! I hope you enjoy this free walking tour of Rome! The tour details and information were accurate at the time it was written. I do check for updates periodically, but errors may still occur. Business hours, pricing, and menu items are subject to change at the shop owner’s discretion. Please email me if you come across anything that needs updating. 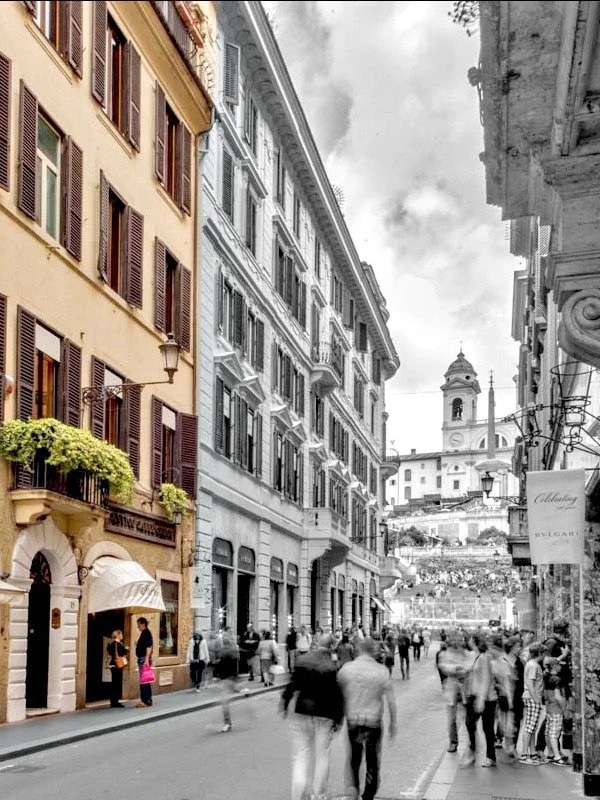 I chose to stay at The Inn at the Spanish Steps mostly because of its location – right above the luxury shops on Via Dei Condotti and literally steps from the famous Spanish Steps. It was exactly where I wanted to be! While not a 5-star, the service is remarkably good at this luxury boutique hotel. And it has the character and quirks (like a vintage lift) I’ve come to expect from properties associated with Small Luxury Hotels of the World. 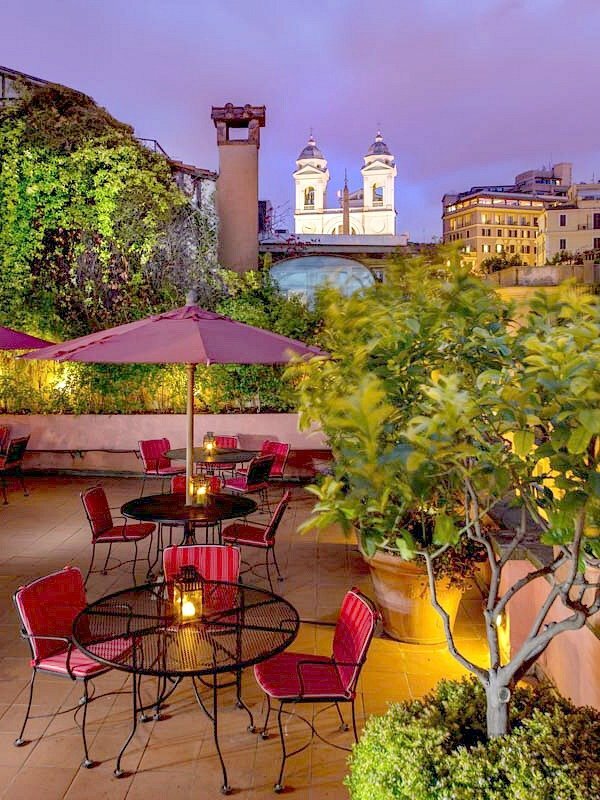 It also has a lovely rooftop terrace perfect for enjoying an aperitivo after a long day of sightseeing. Bonus: the oldest cafe in Rome, the Antico Caffe Greco is right next door! A latte will set you back about 9 euro but consider it the price of admission to a Roman institution. Everything you see I owe to pasta. Eataly Rome Guide with essential information including how to get there, opening hours, shopping, restaurants, cooking classes, and more. When it comes to food and drink, every culture has its rules. And Rome is no exception. Check out these 14 tips so you can eat like a local in Italy’s capital. Find out where & what you’ll eat on the best food tour in Rome. We’ve got the scoop on the #1 tour on Trip Advisor’s list of the world’s best food tours!